Firefighters and EMTs are on the front line of defense when house fires, accidents, natural disasters, and even terrorist attacks happen in cities and communities across the country. The nerve center for firefighters and first responder teams is the local firehouse/fire station. It never closes, and the team of men and women who serve always stand ready. That’s why when a local fire department in a Northeast township experienced an internal fire, it set the community on edge. The accident left citizens vulnerable and city officials scrambling to find a quick solution to get the fire station up and running. The township began a web search that landed on Mahaffey. Mahaffey Project Manager, Joe Berger, reached out to begin a dialog about the project. Since Mahaffey had recently completed a temporary structure nearby for another fire station, Joe suggested the officials look at the result. Over the weekend they drove to the site to view the structure. 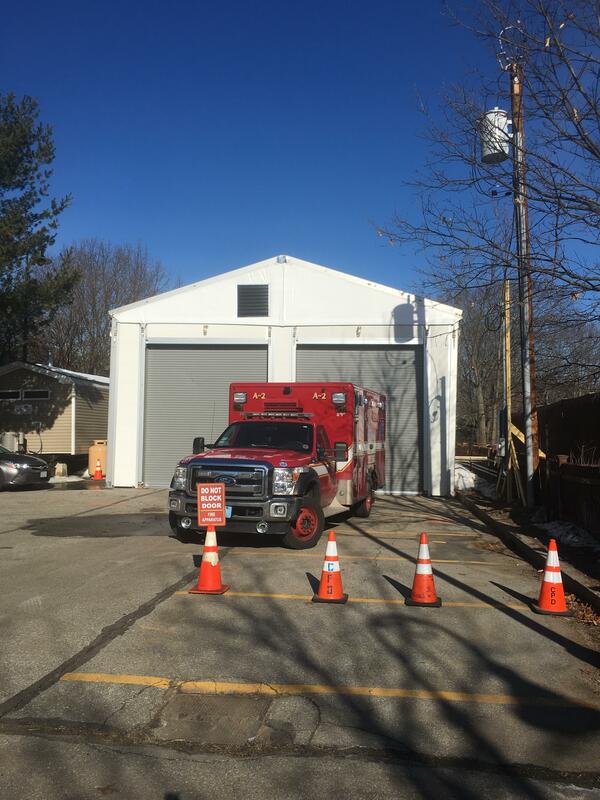 By early the next week, Mahaffey was chosen to design and install the temporary fire station. Joe was immediately on-site to meet in person with city officials. 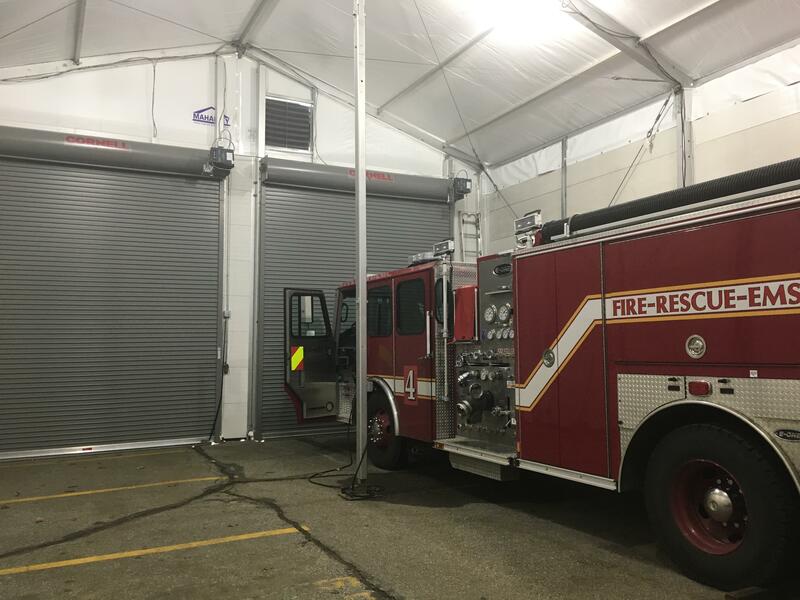 The choice was based on Mahaffey’s quick response to the customer, obvious expertise in installing temporary structures and decades of experience in the industry. Time was the biggest challenge Mahaffey faced with the fire station structure. Fire stations are planned within a certain radius of the community they serve. A big concern for the customer was that citizens within the proximity of the disabled fire house would have a longer wait should they require first responder service. The installation couldn’t happen soon enough. Additionally, they requested a structure that could serve as staging bays for the fire truck and ambulance-essentially a two-bay structure. Vehicle access doors were a mandatory requirement and the first responder team needed quick, easy access the structure. Ventilation for the vehicles was also necessary as was interior lighting for the station. It was wintertime in the Northeast, so snow loads had to be a consideration in the design. 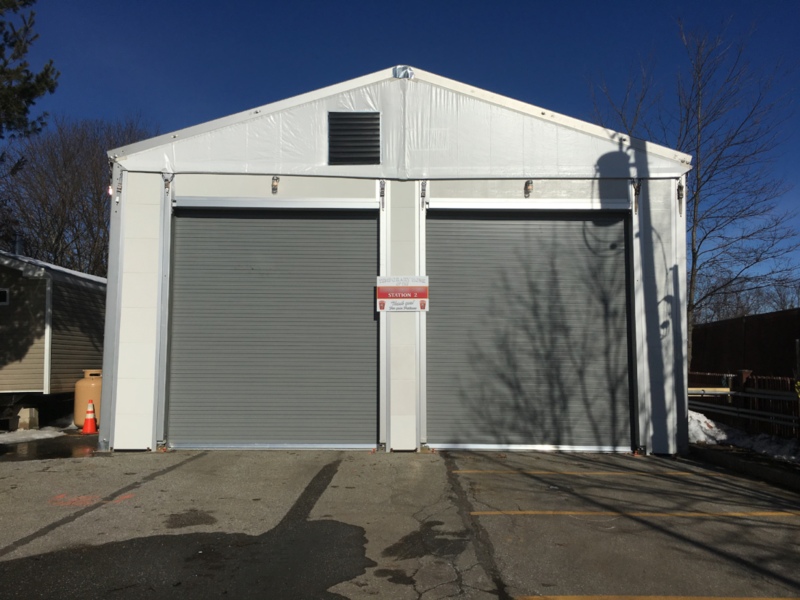 Considering all the customer’s needs, the SuperSeries™ was the perfect solution for the fire station project. The SuperSeries™ is modular with 16.4 ft. or 5m, bays added one to another for theoretically unlimited lengths. The hollow, aluminum box beam uses an ingenious groove in each of the four corners. A fabric welt (connector), called a keder, slides into the grooves in the box beam. The result is a lightweight fabric structure that can be rapidly installed and that can withstand severe weather conditions. Additional products proposed included, two motorized bay doors which could open quickly when required and an employee entrance tunnel leading from the living quarters to the station. Inside the station, insulated hard wall guardian panels were recommended for their safety and energy efficiency features. The Mahaffey team worked with a tight timeline from the initial meeting until the completion of the fire station project. The entire process from finalization of the order request to installation was done in within a two-and-a-half-week timeframe. This included the installation of the pre-fab living quarters by an outside vendor and the site choice for the temporary structure. Project Manager, Joe Berger, advised the customer on both the choice of the pre-fab trailers and the choice of the local transit authority’s asphalt parking lot for the temporary structure. The installation of the structure took three days to complete. One of those days was focused on the ventilation fans and louvers. Most of the structure was completed within a two-day period. The fire department was back in business in less time than could have been imagined. As a bonus, the location they arranged through the transit authority allowed them to quickly serve the same coverage area from the temporary location. Officials were very pleased with the quick turnaround Mahaffey provided and that their first responders were able to again fully serve the citizens of the township. First responders don’t have the luxury of downtime. In an emergency, it’s important for customers to have a vendor they can rely on to get the job done right and get it done fast. Mahaffey has years of “boots on the ground” experience setting up temporary base camps and extreme weather structures that can be turned around in just a few days. Our portfolio of projects contains hundreds of examples. The next time you’re in a situation that requires a fast, reliable, professional partner, contact Mahaffey!